As a high school student, Kelli Palmer '98 wasn't planning a visit to what was then Elon College during a tour of several other North Carolina schools. 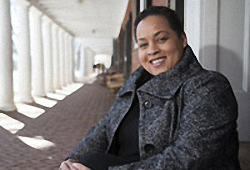 Yet, as she traveled the stretch of Interstate 40 between N.C. A&T and Meredith College with her mother, a highway sign spurred an impromptu tour of the campus and a promising conversation with former associate director of Elon admissions L'Tanya Richmond '87. The rest, as they say, is history. "I knew I was going to attend Elon by the time I got back to my mother's car," Palmer says. Years later, when Palmer's role as assistant to the president at the University of Virginia provided an opportunity to attend a planned giving seminar, her thoughts turned to Elon. She had been named executor of a relative's estate, and the match between planned giving and Elon quickly materialized. "Choosing a planned gift allowed us to give to a place that my family unanimously agrees has had the single greatest impact on this generation of our family, which is Elon," said Palmer, who was named Elon's Young Alumna of the Year in 2007 for her contributions to higher education and her community. "It also simplified my role as executor, because once I relinquished the funds to the university, my job was done," she says. "It was wonderful to put something into place that met so many needs and benefited Elon at the same time." After all, Elon is where Palmer discovered her deep love of learning, a passion that drove her to excel in Elon's Honors program and later earn a master's degree at Wake Forest University and a doctorate at UVA. Palmer's undergraduate experience at Elon also fueled her desire for a career in higher education, as she pursued a path that allowed her to affect the lives of college students the way Elon's student affairs staff had affected hers. By designating funds from the estate gift to Elon's Black Alumni Network Scholarship, Palmer has done just that. Endowed by the Black Alumni Network in 2010, the scholarship benefits African-American students with academic merit and financial need. Palmer was a founding contributor to the fund, working alongside alumni Priscilla Awkard '95 and Darryl Smith '86 to build support for the scholarship. "The Black Alumni Network Scholarship allows for the best and brightest students in the African-American community to be present at Elon," says Palmer. "The best way for me to honor the role Elon has played in my life is to make that experience possible for the next generation of students."